Pourriez-vous me renseigner? | One quality, the finest. I hadn’t been to the famous Marché aux puces de St Ouen at the north end of Paris for about fifteen years. Since moving to the Boston area and furnishing our new home, I’ve had more interest in antiques, so I decided it was time for another visit. Between being the director of a summer program in St Andrews and one in Paris, I thought I needed a day off – or at least a partial one. Sunday was very calm in our office, so I decided it was the ideal time to slip away, as the Marché aux puces are only open Saturday through Monday. To get to the largest Marché aux puces in Paris, take the 4 subway line to the northern end, Porte de Clingnancourt. When you get off, it’s not the most savory part of town, but just follow the throngs and signs. You’ll first pass by people selling illegal knock-offs of couture goods, things that “fell off the truck,” and tacky souvenirs, either spread out on blankets or proffered in the vendors’ hands. Keep going. Then you’ll pass stands of cheap clothes and incense. Keep going. 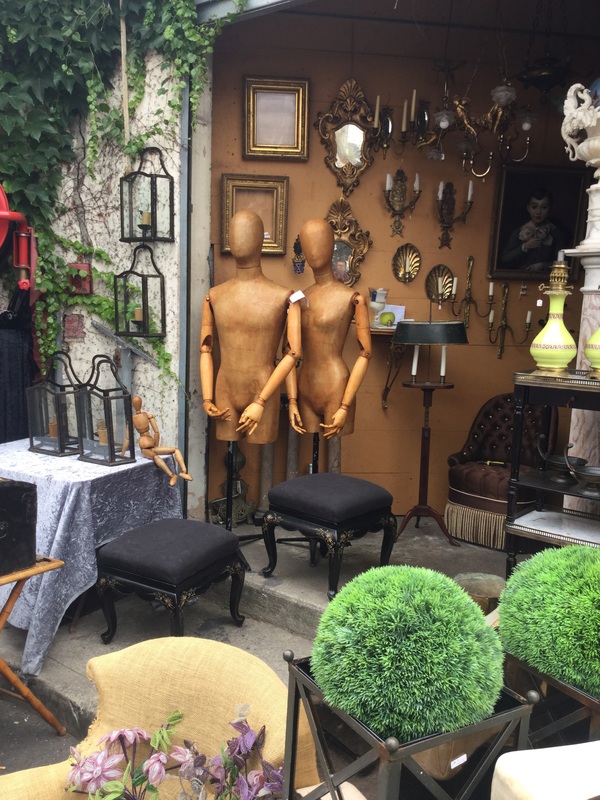 Follow the signs to Marché Paul Bert if you want to find antique or vintage items that are worth buying. The stands that open directly onto the street generally have things that are less precious and more affordable. This is where I spotted a cache pot in porcelain that caught my eye. The burgundy glaze was perfect for my home and it would look terrific with an orchid inside. There was no price marked on it, so the negotiations began. 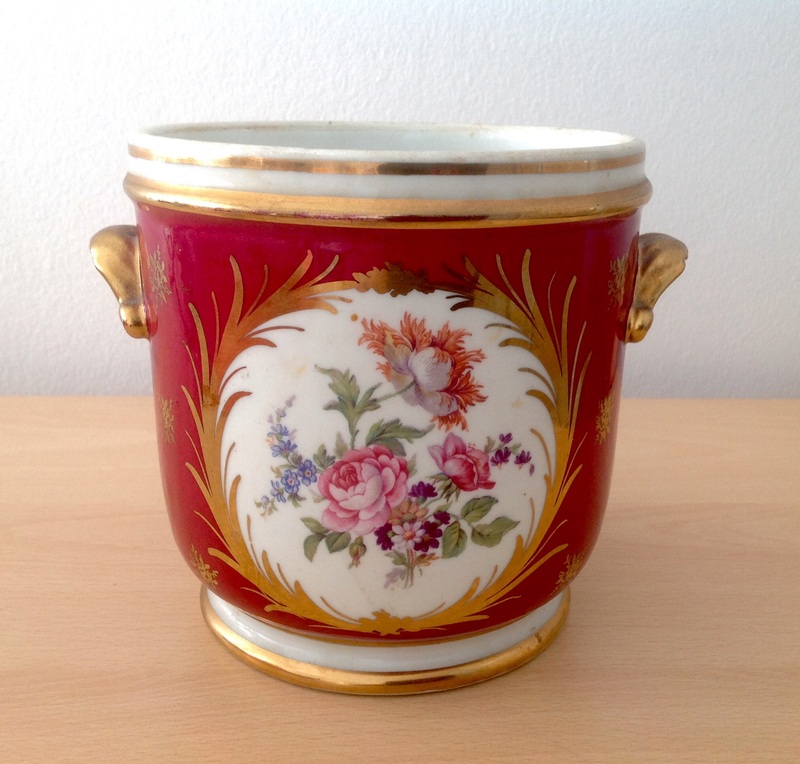 The proprietor told me about all of the wonders of the cache pot and said that it had just arrived and that he was planning to ask for €60, but said that he would let me have it for €30. I hefted it and thought about carrying it in my hand luggage all the way home. I thought at €25 I’d be happier about the weight. I tried. I failed. I attempted the walking away in sorrow trick to see if the price would drop. It didn’t. I decided to keep going and see what else I might see at Paul Bert. I went inside the main building of Paul Bert. There were many splendid things. I spotted another lovely cache pot tucked in a dusty corner, blocked by piles of other merchandise. Here would be a bargain, I was sure. The proprietor produced it for my closer inspection. 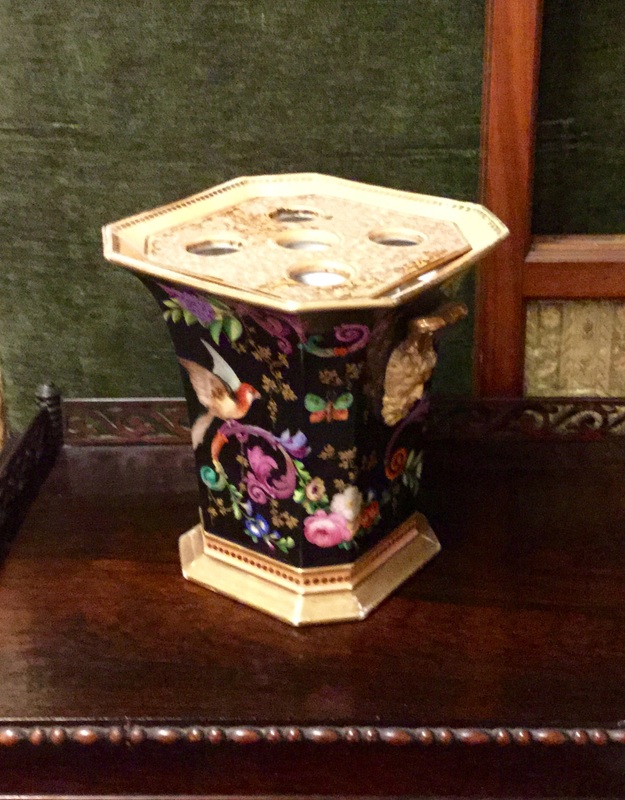 It was actually a tulipière with a cover with holes in which to place blossoms. He told me that it was €1000, but he could let me have it for €800. Even with a €200 discount, my other cache pot was looking much more attractive, and even lighter to carry. 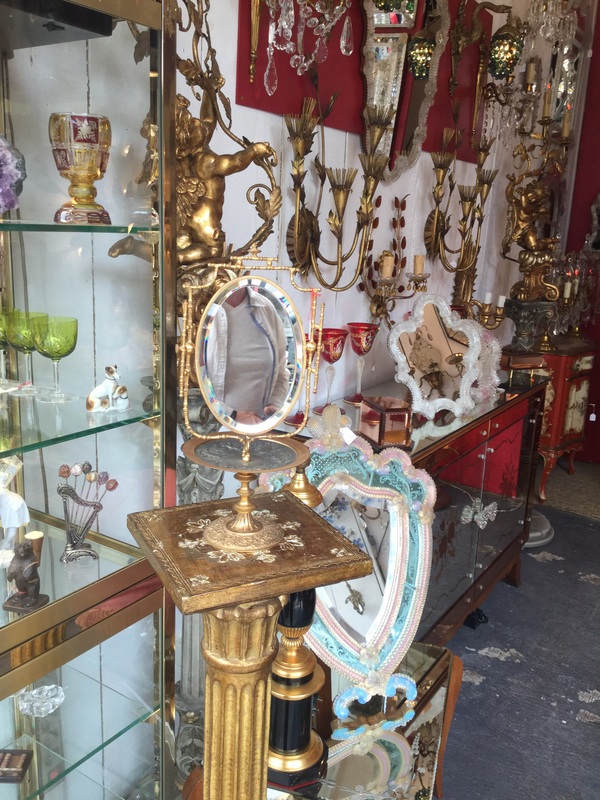 I admired many, many beautiful objects – Hermès enamel bracelets, chandeliers dripping in crystal, paintings that looked worthy of a museum wall. 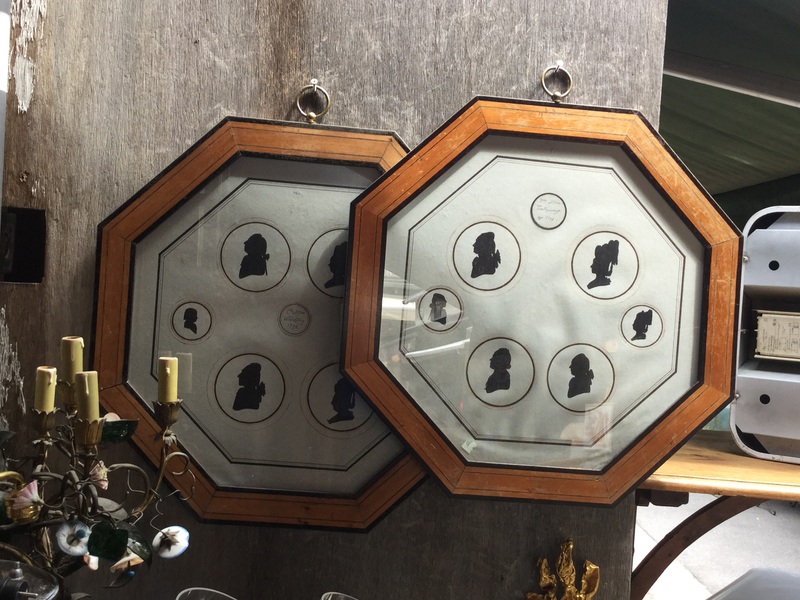 I saw an interesting pair of silhouettes that I was tempted by for my husband. The price of €700 was not shocking, but they were quite large to take home. I passed. I loved a delicate little mirror on a stand, perfect for a vanity. I was very tempted, but €580 was a lot for me to pay for something that I really didn’t need. Whenever I had a question about an item, I would say, “Pourriez-vous me renseigner?” (poor-e-ay voo muh rohn-sen-yay), which means, “Can you give me some information?” and proprietors were happy to oblige. For example, I learned that the small starburst mirrors, usually convex, are called “sorcières,” or witches, because they allowed people to see every corner of a room to make sure that no evil spirits were lingering. 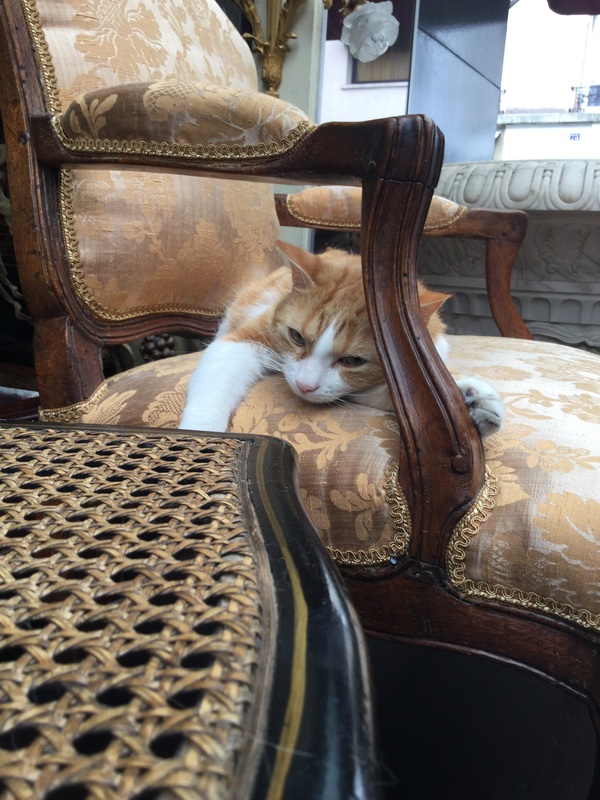 I was getting as tired as the cat I saw snoozing on a chair, so I had a crêpe before heading back on the métro. I decided to go back to the stand with the cache pot and see if it was still there. At first, I thought it was gone and I kicked myself for quibbling over €5. Then I spied it in a display case, now marked at €50. The proprietor remembered me and the price he’d offered. I handed over my €30 and left with one cache pot swaddled in newspaper that may or may not be worth €30, but I was enriched by a day spent among beautiful objects and knowledgeable proprietors. 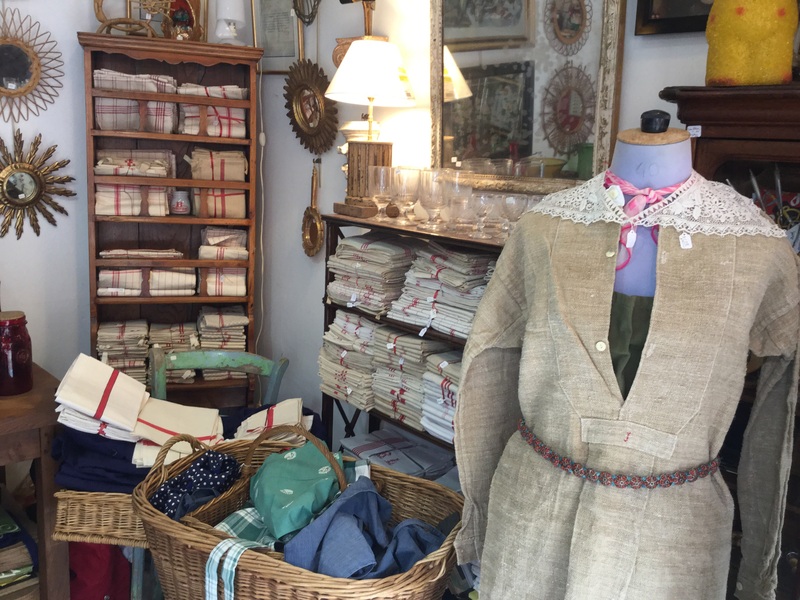 This entry was posted in Shopping, Travel and tagged antiques, Marché aux puces de St Ouen, Marché Paul Bert, Pourriez-vous me renseigner?, vintage shopping in Paris. Bookmark the permalink. 2 Responses to Pourriez-vous me renseigner? So enjoy your blog!! The “Ines Little Diaries Videos” are great, really liked the lady’s satchel/purse she has. Paris is my favorite city to visit! I can see you & Cliff living there. What exactly do you do in the Summer in Paris? How do you find programs there? Hope you are all doing well. Has your daughter completed her graduate school? So nice to hear from you! I agree that I should live in France. With the Euro so low, now is the time to buy an apartment! If only Cliff saw things the same way! In the summer, I am the director of a program in Paris for students from all around the world. They take academic courses and have a full-range of cultrual activities. I love living here and learning from my French colleagues about new places to visit. I found out about this program several years ago from a school administrator who had worked for them in Oxford where they have another program. It’s the highlight of my year. Laurien probably has two more years to go in her doctoral program. I hope that all of your children are also doing well.